The Bench Official Store launch was gazed by long-time endorser Max Collins and Filipino Actor/Model Marco Gumabao together with Bench GM Jude Ong. Watch the video below to glimpse the models showcase the latest Bench apparels at the catwalk. 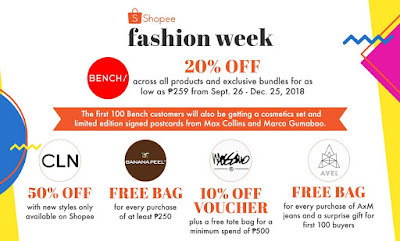 Bench Apparel and Bench Body also offers exclusive bundles for as low as ₱259.00 on a limited time only, so fans of the brand can usher in the festive year-end shopping period with Bench on Shopee. Some of the items come with free shipping too! To top it all, first 100 Bench shoppers will win a free cosmetics set and limited-edition postcards signed by celebrities Max Collins and Marco Gumabao.